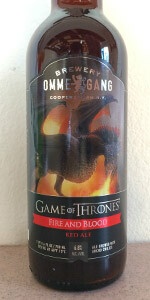 Ommegang and HBO® announce the newest beer in the Game of Thrones® collaboration series. Through its first three seasons, the critically acclaimed drama has become the biggest show on HBO. Named after the motto of House Targaryen, Fire and Blood is inspired by Daenerys Targaryen and her three dragons, Drogon, Rhaegal and Viserion. To celebrate the rebirth of dragons, three different labels were created by the Game of Thrones visual effects specialists, each depicting one of Daenerys' feared dragons. Randomly distributed amongst the cases, each case will contain all three bottles. On sale March 31, in time for the debut of Season 4, Fire and Blood makes for the perfect season premiere pairing. The beer is available in 750ml bottles and 1/6 barrel kegs. Fire & Blood is a 6.8% ABV Red ale, brewed with pilsner, Cara-60, Midnight Wheat, flaked rye and spelt. Assertive hopping includes CTZ, Styrian Golding and German Tettnang hops. Spiced with de-seeded Ancho chilies. Fire & Blood has a deep, dark red hue with a persistent, creamy, off-white head. Aromas of ripe fruit, raisins, malt & slight spice, followed by a slightly floral and spicy hop character. A fruity, sweetish malt taste gives way to faint drying provided by the hops & rye. 750 ml. Bottle Cork and cage. A deep brown color with dark amber and ruby highlights. The super fluffy, high, creamy sea foam topping is rather impressive. Staying power is supreme....never really recedes completely. Lots of creamy clumps of foam left at all times. Amazingly sticky and clumpy lacing. Just the way it should be. A very dense, malty nose at first, caramel, spices, burnt wheat and rye, oats,apple cider, tangy and earthy hops equals a very wild and interesting aroma. The light and ultra crisp mouthfeel really packs a punch. Dry, earthy hops, crisp malt and added herbs, spices and rye really intensifies the earthy bite. Very smooth and light, airy effect in the finish, crrtainly dry from beginning to end. A crispy sweet malty taste happens first, sour earthy tonesfrom the hops and yeast, very spicy from the ancho chilies and old-world hops. Candied apples, raspberries, white wine....certainly adds up to some seriously complex within this light bodied ale. A very tart, herbal and spicy brew, solid malty body, dry edges, funky yeast and hop combo makes this endlessly interesting. I feel like my fellow reviewers might've missee some of the subtle but excellent intricate complexities of this style. I missed the first two GoT special releases from Ommegang so I was very happy to jump on this one before it disappeared like its predecessor. Of course the entire thing is a shameless marketing ploy to get people to watch a show and to buy a beer. Done and done. The tie in is pretty pointless, but for fantasy nuts or beer collectors its a chance to get your hands on some classy booze with a pop culture reference tied in. For collectors/traders, this beer may be worth picking up for popularity of the show, making it valuable. For drinkers, this is a good beer with a neat bottle. Ommegang has a very good reputation as a quality American craft brewery that does justice to Belgian classics. So far they are the only US made Quad that I think does the style justice, and I also love their Rare Vos. The Fire and Blood Red Ale pours a deep crimson, almost brown, is a little murky, and if poured "vigorously" as the bottle suggests, you get a thick tan head. The aroma of this ale definitely reminds me of Belgian yeasts. If you put it in a tulip glass it would be very easy to confuse with a Duvel. There is something else there that may be the peppers the brewer alludes to, or possibly the rye. I've never had a beer with either in it, so it may be confusing my sniffer. Very aromatic, very pleasant. The mouthfeel is pretty heavy. Not quite oatmeal stout territory, but definitely headed in that direction. Its smooth on the tongue and invites the drinkers to swirl it around and let it hit all of your taste buds. The flavor is super complex, without any one riding high over the others. The malts and hops are in perfect balance for me, your IPA hop heads may find it too sweet. The finish is nice a clean, not cloying or lingering around, with a hint of what I again assume is the rye since it has a savory bite to it that is maybe salty in nature. To say the ancho peppers add a lot of "fire" to it would be over estimating its bite a little, however it is inviting and goads the drinker into going in for more. This is a great beer. I wish they would do something similar in a regular release. Barring that I may need to go get another bottle and hold on to it for a special occasion. 750 corked and caged. As God and the monks that at least inspired Cooperstown intended. It pours opaque medium brown with a creamy light tan head. Smell is peppers, bread, The taste is an intense pepper up front that quickly fades to a smooth bready, biscuity flavor. Very nice, very interesting combination of different things going on. Overall, I like this. It is a really surprising combination of flavors, but one that works much more than I expected of a "stunt" beer, be it a stunt due to the HBO tie-in or the use of peppers and the incorporation of "fire" in the name. My hat is off, I enjoy being surprised, at least pleasantly, and today I was. Poured into my large Gulden Draak tulip, Fire & Blood is dark reddish brown with a hug light sand head leaving clingy, foamy lace. Smell is spicy esters, clove. Some herbal, dusty hops. Taste is pretty yeasty, some spice esters balance with lighter, richer malt. A little phenolic. Not tasting the chile. Drinkability is pretty solid, this is a nice Belgian Amber. A: This poured a cloudy dark mahogany with fluffy light tan head. S: It smelled like grassy and waxy hops, with some spicy Belgian yeast. T: It tasted like earthy grass and waxy hops, with some spicy Belgian yeast. It had a clean waxy aftertaste. M: It was somewhat thick with lots of fine natural carbonation. Nice slick body. D: This was an ok Belgian ale, but the scent and taste didn't have any unique character. The body was good, and the finish was smooth, so it was pretty easy to drink. Not bad, but very forgettable brew.